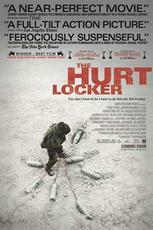 This weekend I had the chance to sit down and watch a movie I had missed in the theater: “The Hurt Locker.” It was a very interesting film, and I liked it. I hesitate to say it was a “good movie,” though because the subject matter seems a little too close. It’s hard to consider a movie about the Iraq war a “good movie” when one of my best friends and my brother-in-law are both only recently back from that hell, and so many other soldiers remain in the line of fire. But, it was an interesting film with a compelling story that was well-told. But, I’ve gotten away from where I was going with this a bit. Of all the scenes in the movie that were heart-wrenching, and there were a few, this one got to me. It got to me because this character, someone I thought I had come to at least begin to understand, was saying something that felt so alien to me that I cringed a bit. I was more upset by that moment than by any of the violence and death that had been portrayed. The reason is it communicated a certain loss of hope to me. I don’t believe we have to stop loving the things of our younger lives. Does that love change as we mature? Of course. But, that doesn’t mean it has to go away. We can continue to embrace all the things that surround us as being worthy of love and admiration without stalling in our growth and maturity. Love is not a static emotion that once felt is immutable for its object. It is a living part of us. No, we will not love that jack-in-the-box as an amazing device of wonder housing a friend always happy to jump out and see us when we grow older. We will see that it is tin and a stuffed animal. But, we can remember the joy it brought us. We can remember the contentment of hearing the tinny music and the thrill of the sudden pop. We can remember and keep that love and joy in our hearts. I think that our ability to do such things is one of the things that makes us uniquely human. We can keep the memory of all those feelings with us and have those remembrances that bring that love and joy back to us. It is that capacity that makes a parent buy a bike for their child. They remember the joy of the wind in their hair and the world speeding by. It is that remembrance that makes you curl up with a favorite movie that your significant other has never seen. It is dear to you and you want them to share that experience. And above all, it is that storehouse of remembered love that we lean on when times are dark and all seems lost. To me, it is that very thing that defines hope.